Perched at the edge of the Caribbean Sea, just a short stroll from Placencia Village, this tropical resort offers an idyllic getaway. The resort features two infinity pools, as well as 400 feet of private beachfront. 19 villas offer the comforts of home, enhanced by spectacular views of the Caribbean Sea. Indulge in Belizean specialties at Cafe Mar, an exclusive beachfront and pier restaurant. Enjoy a wide array of outdoor activities, including snorkeling, scuba diving, kayaking and more. 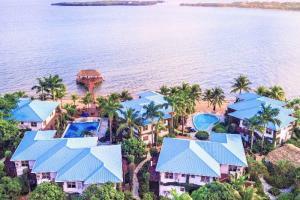 Located in Placencia, Belize, just steps from the beach.